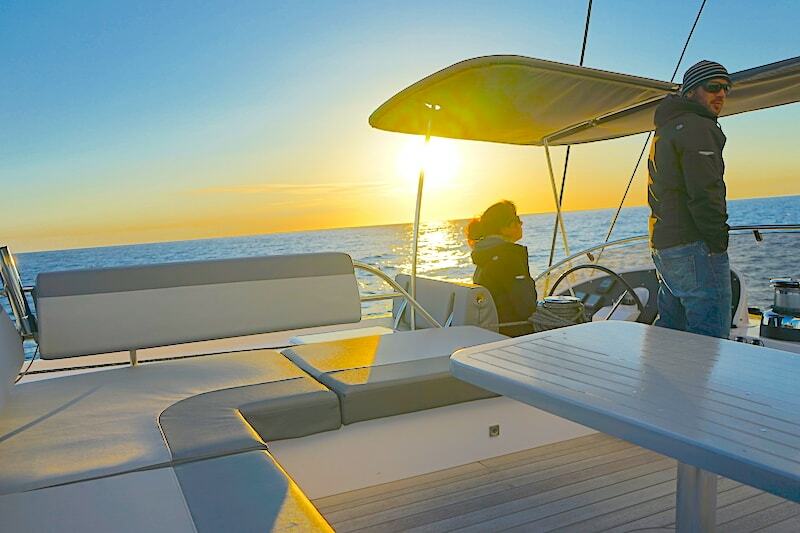 There are many and various ways to build a catamaran intended for long sailing experiences but, since when it was established, Privilege Marine has developed its own unmistakable one, based on three pillars it never disregards: comfort, safety ad sturdiness. 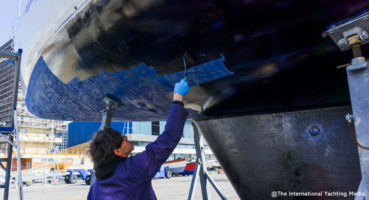 Founded in 1985 by the well-known creator of Vendée Globe, Philippe Jeantot, the shipyard builds, now as then, together with its own customers, custom catamarans where attention to details and high-level finishes determine, from the very moment of launch, the birth of real masterpieces. 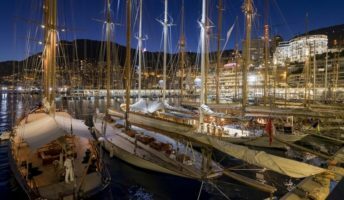 You can therefore realize how the opportunity to sail on board one of this “Stradivarius of the sea” is not a common thing and how, when the opportunity presented itself, I didn’t hesitate and I immediately flew to Palma de Mallorca where the Privilege 6 was waiting for me. 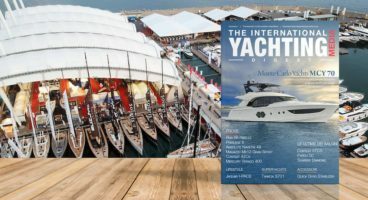 The following is not just a sea trial but the report of a crossing where it becomes unequivocally clear that it is possible to sail comfortably under conditions which would be undoubtedly “inconvenient” for many other vessels. 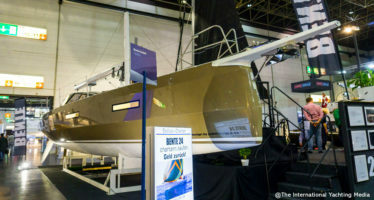 I walk the last few meters that separate me from the Privilege Marine‘s booth at the Palma International Boat Show. It’s the last day of the yachting exhibition, booths are still crowded but the Privilege 6 has certainly no difficulty in getting noticed. 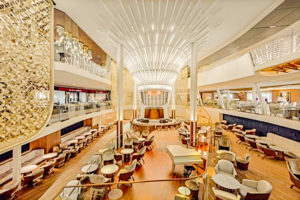 20 meters long and more than 9 meters wide, she catches visitors’ eye with her unparalleled beauty. While I am lost in my thoughts, I’m introduced to the crew with whom I’ll carry out my crossing. 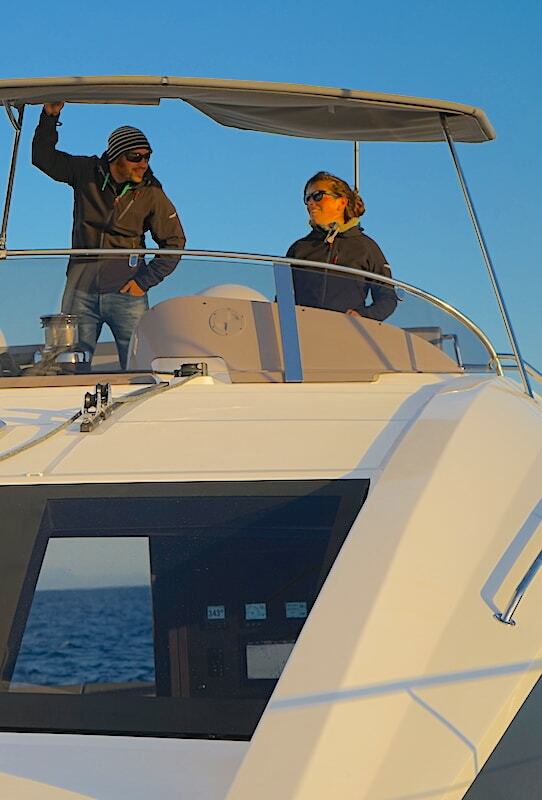 Bernard Lemaignen and Manon Letribot are a couple with a very long experience with the command and daily management of big catamarans, gained during their frequent sailing experiences all around the world. We seat and we talk about the weather: a very strong mistral is coming and our departure, bound by the leaving of other vessels, will not take place before the following morning. I’m given the VIP cabin on the left hull that looks like a five-star microloft, equipped with en-suite bathroom and separated shower compartment. On the following day, it’s 12/13 degrees outside. We take a look at the weather forecast and then, very carefully, we cast off and finally, at about eleven, we slowly go out of that maze of relieving and mooring ropes stretching all around us. 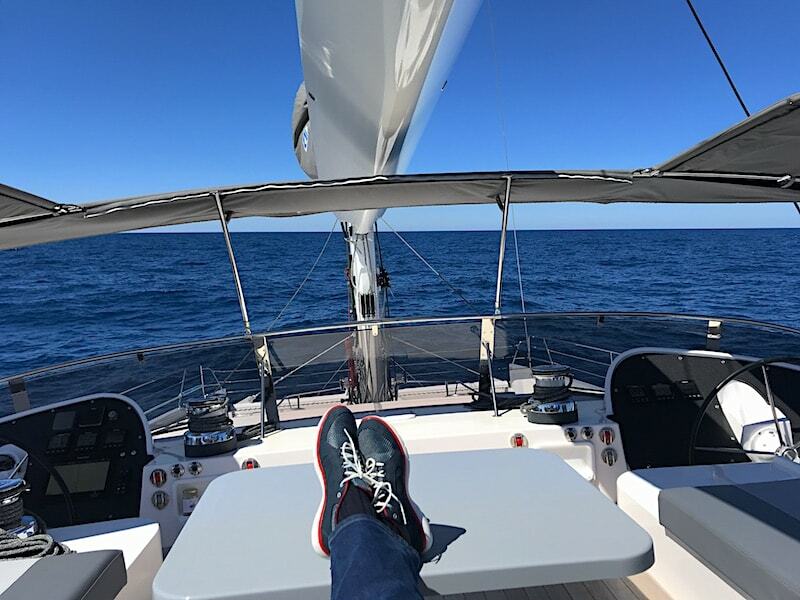 Out of the port, we’re welcomed by a fair fresh breeze, so we sail under power running between 8 and 9 knots in a sea that I would define as calm, whose average wave height tends to increase while we get away from Palma. Meanwhile, we are passed by a pair of 25/30-metre trawlers which, probably headed to Costa Brava, pitch showily and raise high waves as soon as their bows cut through the water. 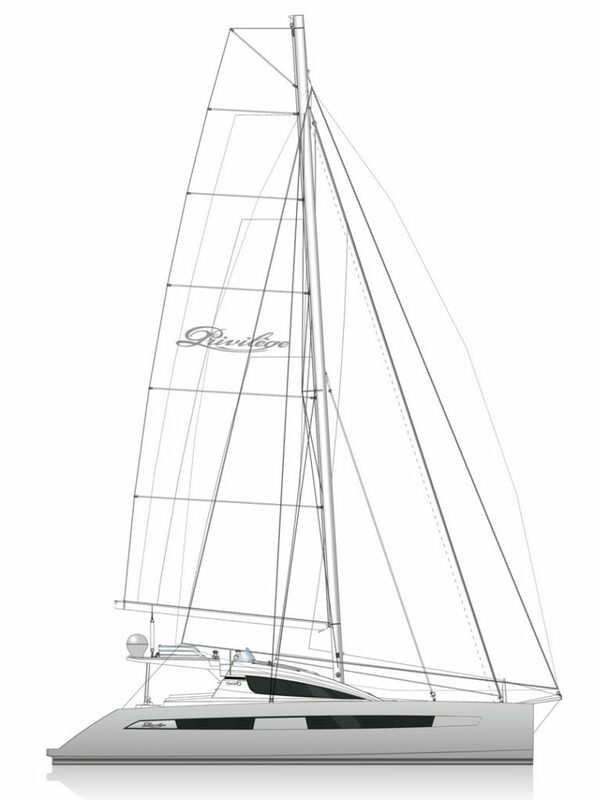 Moving from mono to multihulls requires a few hours for the “sea leg” to adapt itself to the boat’s move. 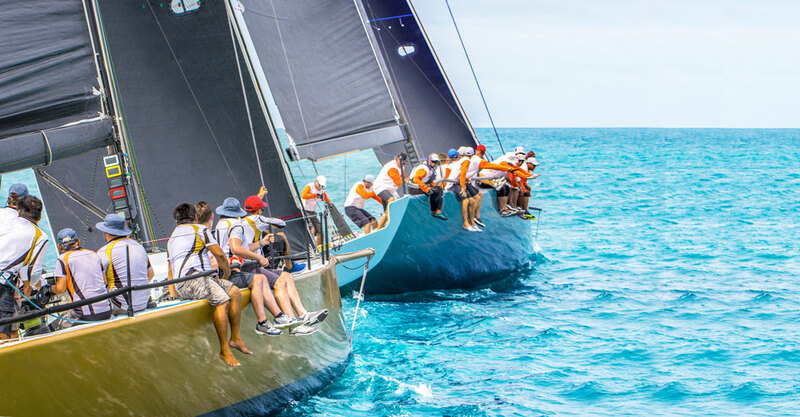 Yes, because, under these conditions, catamarans, too, roll and pitch but in a softer and more progressive way. “Our” Privilege 6 is designed to offer a completely safe circulation on board; the handrails are exactly where they should be and I have all the time to get acquainted with this new movement while I move from the bow to the stern with no problem in a sea that, if we weren’t on board this catamaran, would have forced me to be significantly more cautious. 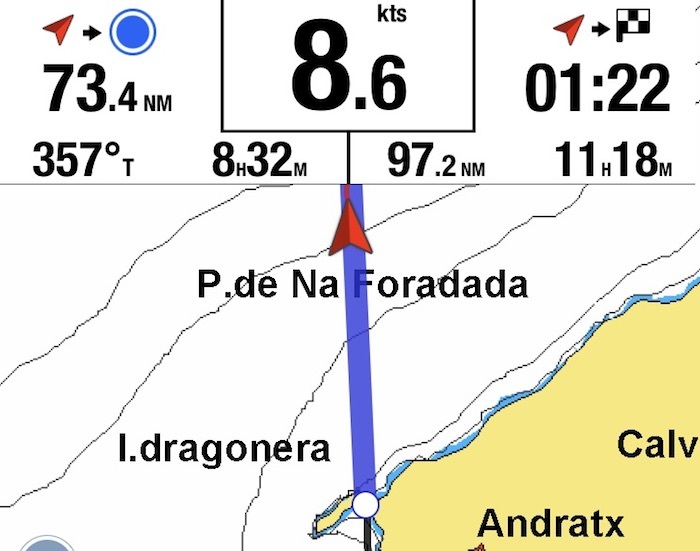 After two hours and half of navigation, we sail between Punta Negra and Sa Dragonera and we’re ready to sail in open seas to Barcelona. A western wind is blowing and the true wind direction is about 35 degrees, so we decide to open the jib in order to gain a little of speed. The maneuver is carried out quickly from the flybridge and, as soon as the jib is raised, the catamaran is immediately 2 knots faster. Sea state is now characterized by 1.5-meter waves that seem to suggest a possible imminent change of direction or strengthening of the wind. It’s two in the afternoon and, considering that our ETA foresees that we will arrived at 03:00 on the morning of the next day, Bernand establishes two-hour shifts for every member of the crew. 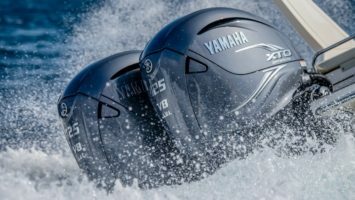 I ask him to show me the alarm parameters of the two Yanmar 110hp engines and I take the first shift. Bernand and Manon go sleeping and, once I am alone, I realize that I’ve won their confidence. For my guard shift, I choose to stay on the flybridge. Despite the cold windy weather, the sun is warm and I don’t feel cold anymore. 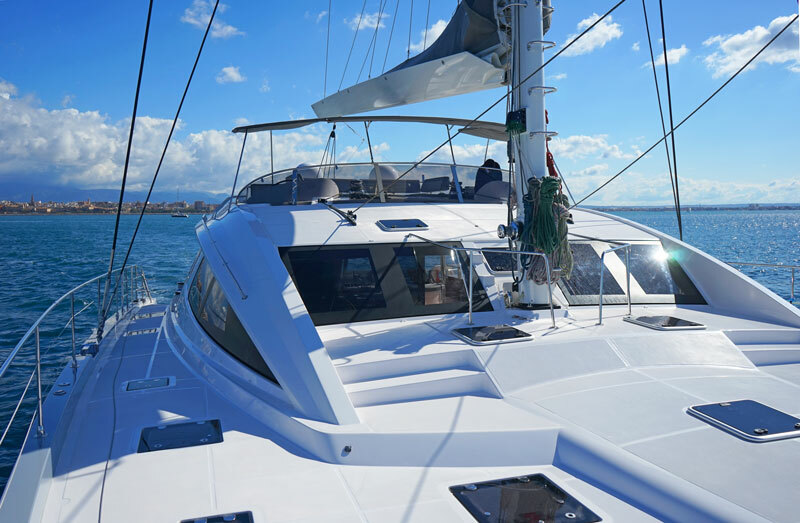 Sailing on this catamaran significantly increases the levels of the comfort and safety perceived, especially if we consider that these conditions would be absolutely difficult for any other boat. My guard shift finishes with no problem and Bernand arrives right on time to relieve me. I’m not sleepy, so we go on chatting while Maron still sleeps. Bernand tells me that he has been sailing since he was child but that he started to actually sail only when he was 20 when he was told that, near there, they were looking for crews for some boat transfers. Two days later, he left Les Sables d’Olonne in the snow to board. He has never disembarked and, during the two following years, he continued to sail between Scotland and French Polynesia, under the command of the same captain. 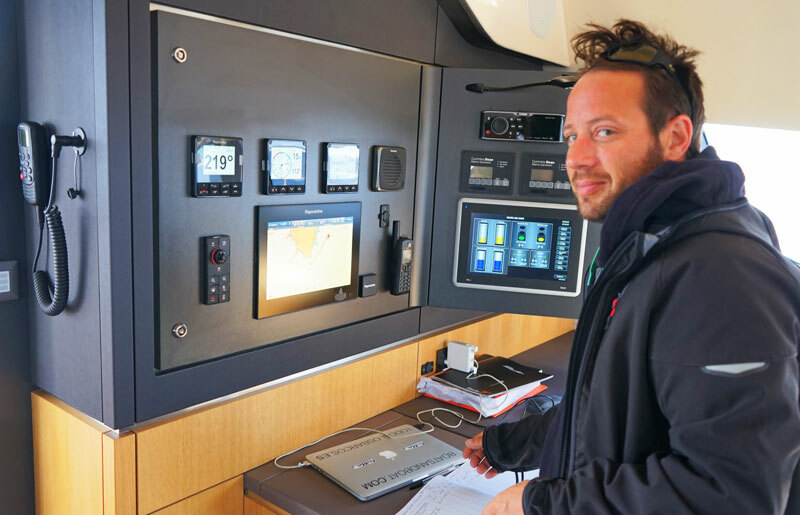 Then, he became a sailor, a captain and started to deliver catamarans all around the world, training crews for their owners. 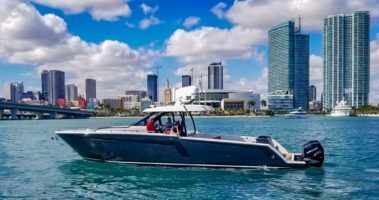 Yes, because the delivery process of a Privilige Marine boat is not a common thing and, in addition to crew training, it also includes a boat “tuning” period until the full satisfaction of the customer. I’m tired and I decide to go sleeping. I go below deck and, as soon as I put my head on the pillow, I fall asleep. An unusual movement and a strange new stability wake me up. I think I just have fallen asleep but a look at my watch reveals I’ve slept for almost two hours. I get up and I get to the deck, where Bernard is up to raise the mainsail. A look at the onboard instrumentation confirms that the wind has changed direction and now true wind is blowing at 15/16 knots with a 60-degree direction, really good for our catamaran. The sailing plan the owner of this Privilege 6 has chosen is small enough, the jib looks like a yankee and the mainsail is not the conventional square top one we’re used to see on board this type of catamarans. Nevertheless, we stop the engine and, as soon as the mainsail is raised, the Privilege stabilizes and starts accelerating. We’re running at about 9 knots while a stupid smile, typical of all sailing enthusiasts, immediately appears on our faces. Dolphins come and greet our bows on many occasions while the sun begins to shine and the spectacle before our eyes promises to be unforgettable. I decide to dare and I pull the drone out of the equipment bag while I promise myself to land with an abundant reserve of battery. I wait for the sun to reach the horizon line, then I launch my drone while both the wind and the sea, maybe by chance, maybe out of respect for the beauty of the moment, decide to fall a little. So, while we sail at about 6/7 knots, I launch my drone and I take this extraordinary sequences. We turn one of the engines on to sail a little faster while Manon prepares dinner. 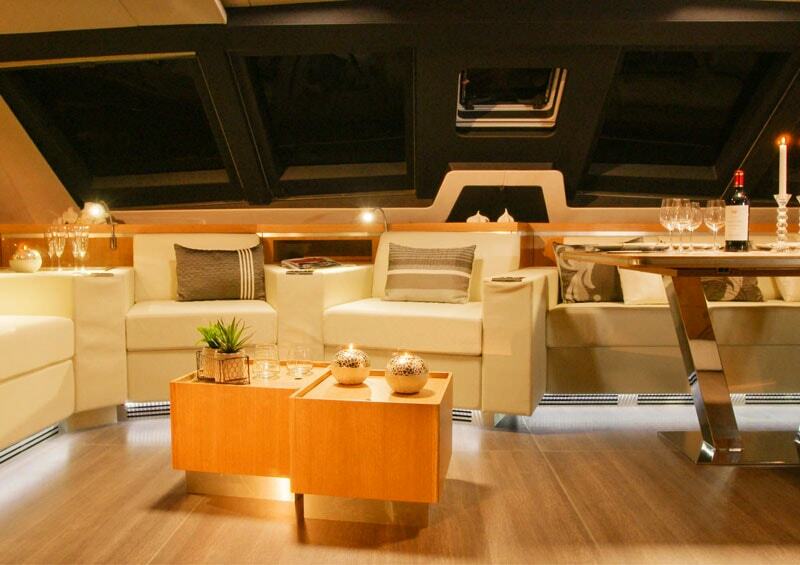 The dinette of the Privilege 6 is huge and beautiful. 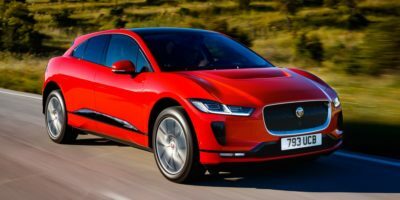 Inside, the safety sensation is amplified and everything that happens outside seems far away. While we have dinner, the night replaces the day and both the wind and the sea get stronger. Now, true wind blows at about 19-20 knots. Just long enough to put dishes and glasses back in their cabinet and long high waves come from our quarter. 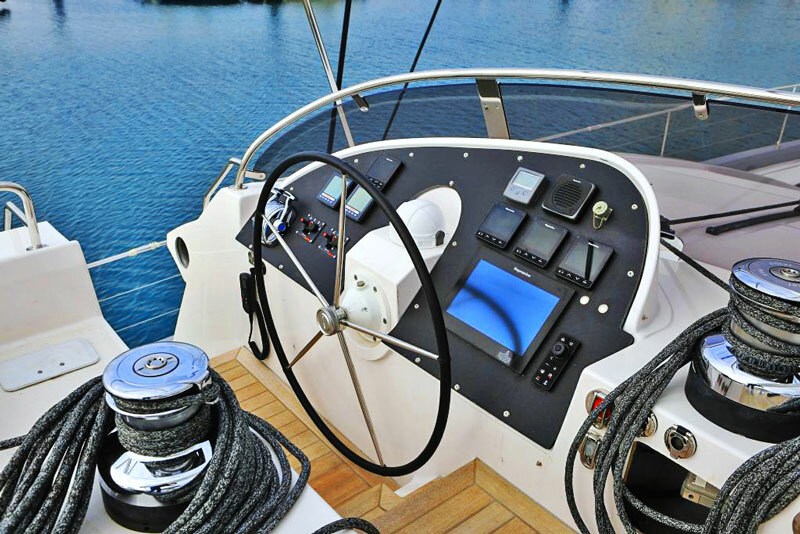 We get to the flybridge, we stop the engine and trim sails. 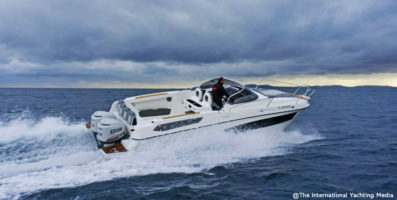 In cross wind and strong breeze, the Privilege 6 runs fast, at an average speed of over 10 knots. We come back to the dinette, we dim all instruments’ lights and we enjoy sailing. There are still 40 miles to Barcelona and sea and wind go on getting stronger. Bernand lays down in the dinette and has a rest while Manon and I take our guard shift. 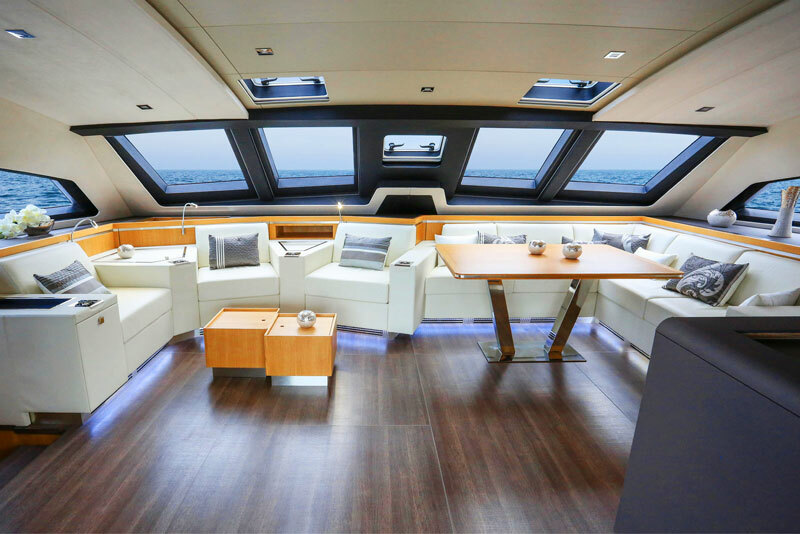 The windows of the dinette give us a complete perimeter view, we can steer from here, making our course corrections from the remote control of the autopilot from the chart table. 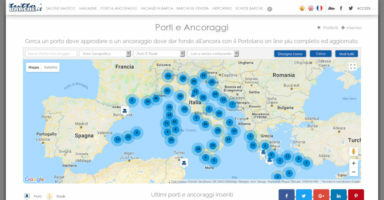 It’s very cold outside and the boat pitches a lot but from here… from here, you can have a first-class world tour even in two-meter-high waves, just like now. Manon is an excellent second mate and can do everything on board. So, she updates the logbook at regular intervals and checks instruments. She and Bernand met during a season on a Privilege catamaran and they have been living and working together since then. 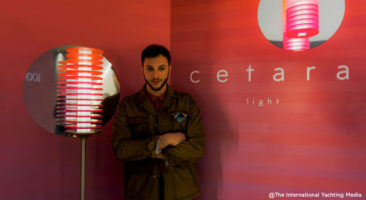 Nice and competent, they are one among the best crew I’ve never met to date. If the wind went on getting stronger, we should trim the mainsail. 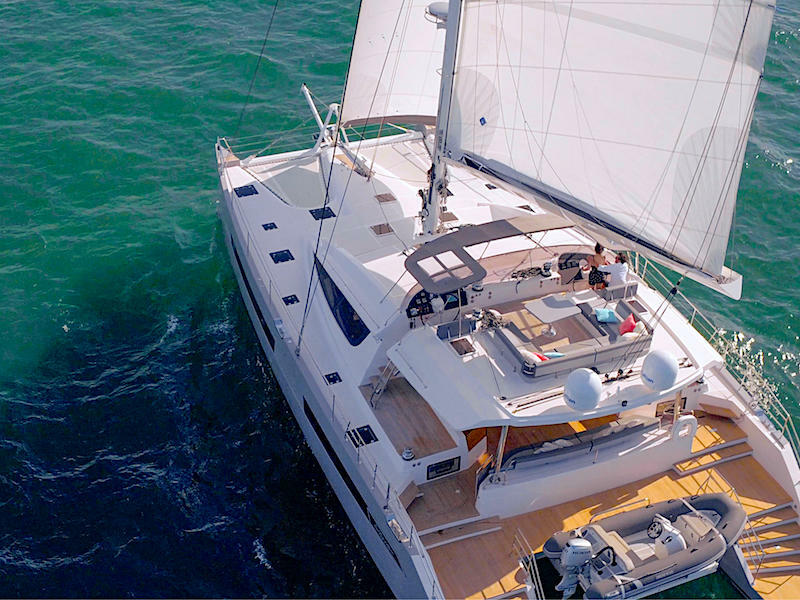 On a catamaran, in fact, sails should not be shortened according to listing, like on monohulls, but according to precise indications provided by the shipyard. Our guard shift goes fast while we constantly look at both the horizon and our wind instrument that, fortunately for us, saves us the shortening maneuver since wind never exceeds 20-22 knots. Sailing in squalls, we touch a speed of 11 knots while the hulls of the Privilege 6 astonish me, showing a natural predisposition to surf. Bernard relieves me and I go sleeping. Another change of trim wakes me. 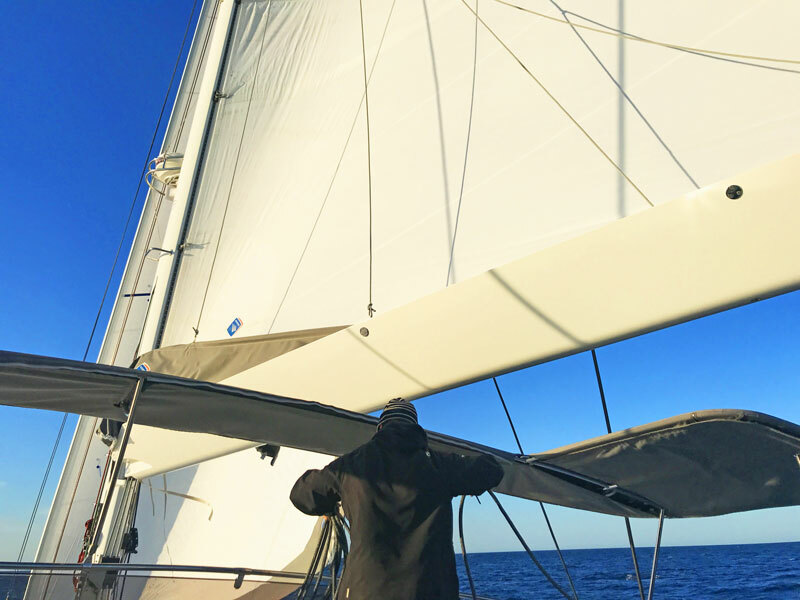 In addition to my vest, I put a sailing jacket on, I get to the flybridge and I see Bernand walking on the “park avenue” boom to put the mainsail in the laxy bag. 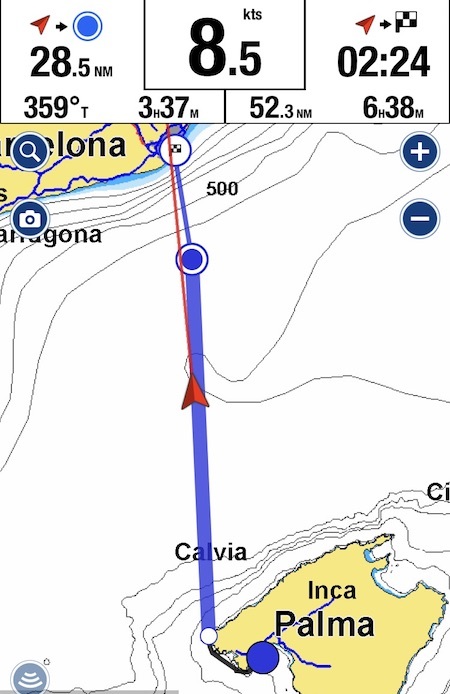 It’s two in the morning and there are still 7 miles to Barcelona, the true wind is blowing at 6/7 knots and our crossing is about to come to an end. The two engines push the boat at 8.5 knots on a slightly rough/almost calm sea. Bernand leaves me at the controls and gets below deck. The traffic of ships and fishing vessels in front of Barcelona is impressive and the radar located just in front of us illuminates lots of ships at anchor. I steer carefully to cross this stretch of sea and, one mile and half from the port, I start to slow down. We moor without assistance at the external dock of a shipyard; Bernard prepares the ropes and then relieves me at the controls. Manon and I “cover” the topside of the starboard hull with many fenders while we approach to the dock and we light it up with our torches. I jump off the bow and I turn a line around a mooring cleat while Manon has already got a rope over the astern cleat. Bernand gives me two spring lines, I secure them and we are finally docked. It’s past three and we are still chatting in the cockpit, none of us seems to want to go sleeping. The emotions of this exciting crossing are still in my eyes in and my mind. Sailing on board this boat is a unique experience even for those who, like me, spend most of the year sailing and testing many boats. 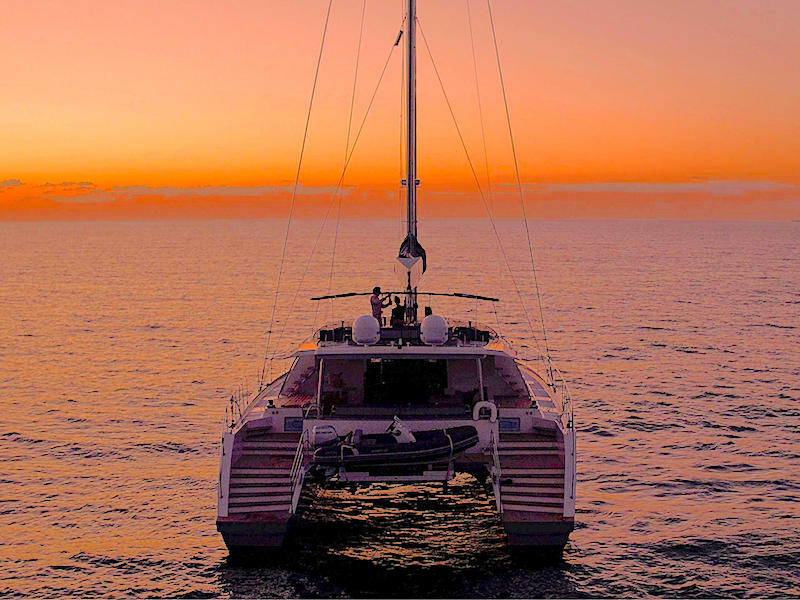 This catamaran has the capacity to convert miles into a pure pleasure of sailing. And this is why, while I get to my cabin, I am not at all happy about having to leave it on the following morning. 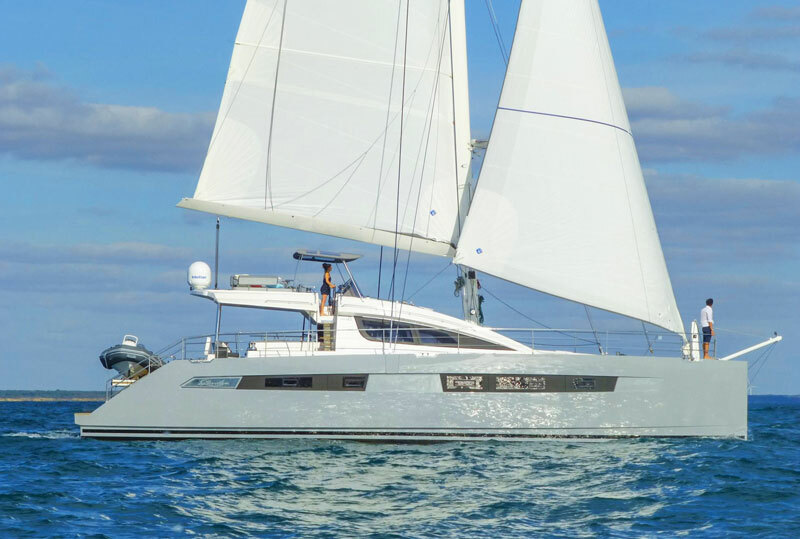 The Privilege 6 is not a 60-footer as her name might suggest. With a waterline length of 64 feet, her overall length exceeds 20 meters. 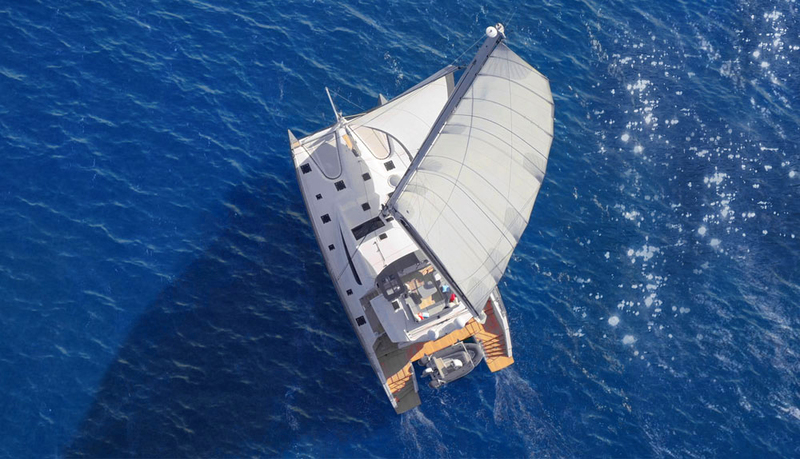 Designed by Marc Lombard in co-operation with Franck Darnet, this catamaran features unparalleled lines and differs from all the other catamarans that, most of times, end up looking like simple floating cubes. 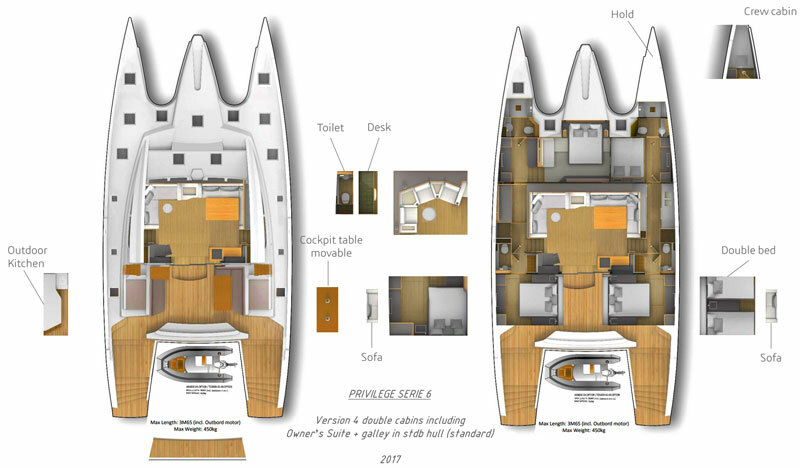 In the Privilege 6, instead, hulls are characterized by a high free border and are harmoniously combined with an apparently low deckhouse that, with its aerodynamic slinky lines, gives the catamaran a sporty coupé’s look while hiding the existence of a flybridge which extends to the stern with absolute lightness. The cockpit is wide and well-protected, equipped with a bar cabinet and perimeter sofas. 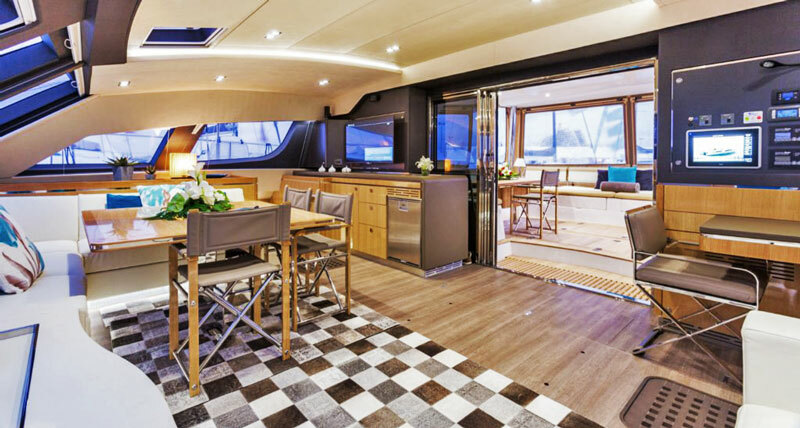 Thanks to a system of sliding glazed doors, the salon and the cockpit create a unique 50-square-meter open space where the owner and his guests can enjoy their cokctails and dinners in total safety and comfort, both at anchor and in navigation. 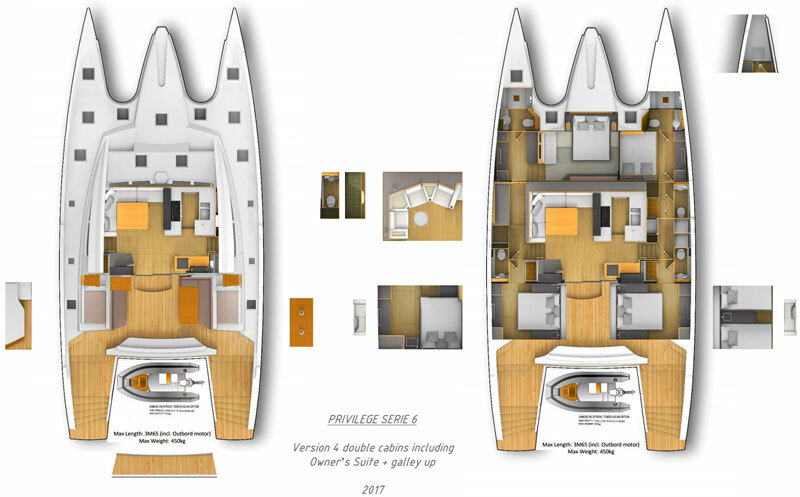 In this version, the left hull is home to the master cabin which, positioned in the bow, benefits from the central elevated space of the catamaran. The result is a huge suite with a walk-in closet and all sorts of amenities. 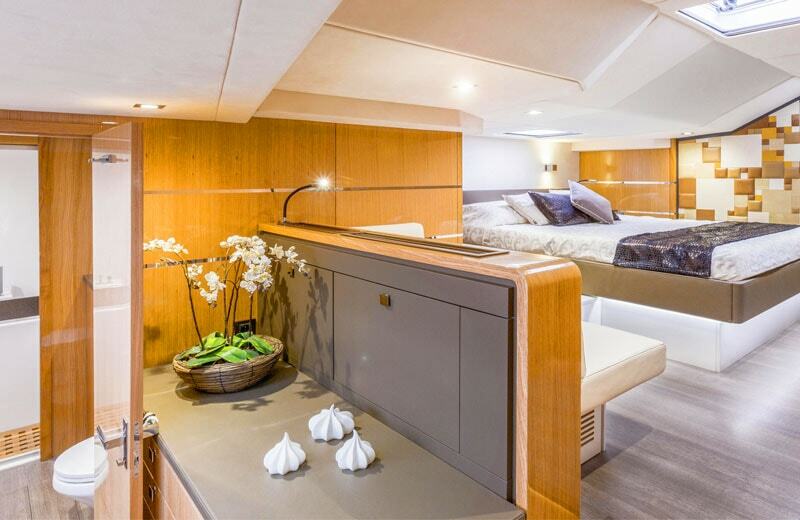 Sleeping quarters include three VIP cabins, for each remaining extremity of the hull. Each cabin is equipped with a king-size bed, en-suite bathroom and separate shower compartment. A crew cabin is situated forward. 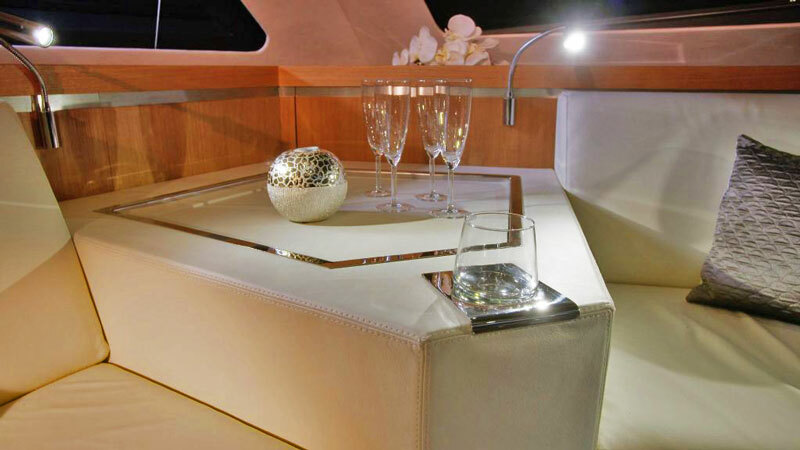 In addition to spaces, what is really striking on board a Privilege boat is the very high level of finish and décor. 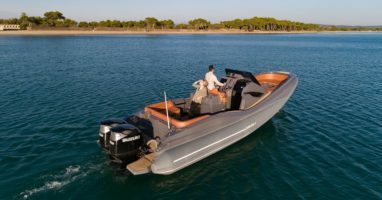 Hand-stitched leather and refined cleverly-matched wood essences provides an overview of the building quality and attention to details of this boat. And the same care can be found also, and above all, in the engineering and positioning of on-board systems. 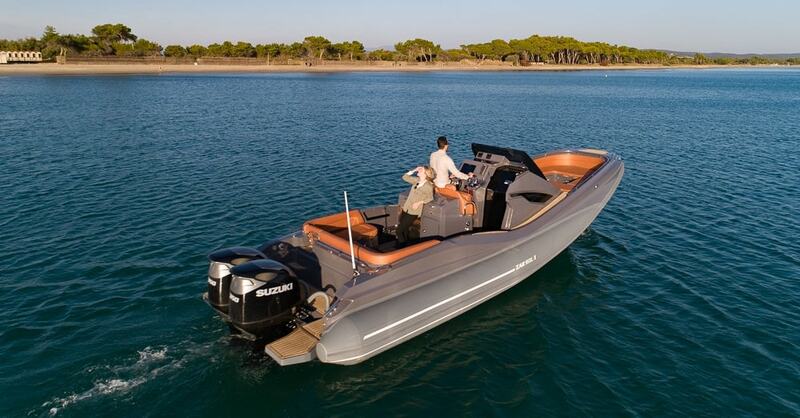 Equipped with two generators, a water maker and a huge fuel tank, this boat features an excellent range and could sail non stop for months. 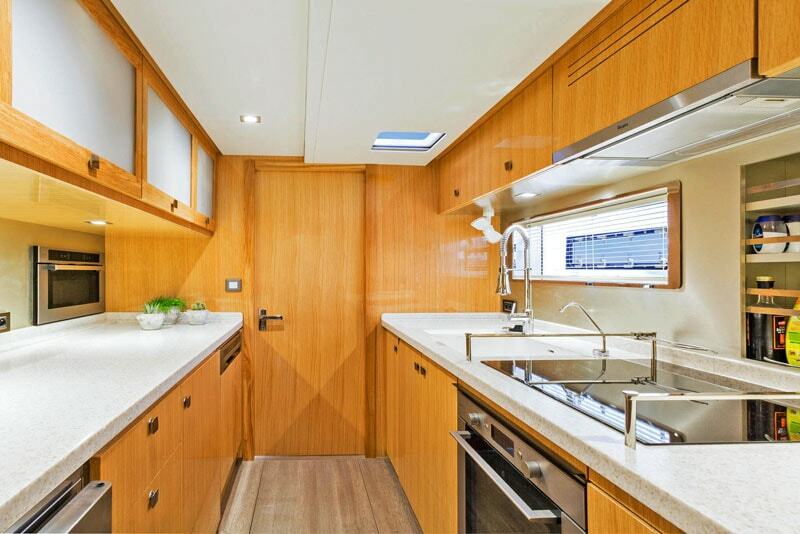 Noteworthy is the galley which, located in the starboard hull and provided with a considerable storage capacity, can be used even in the harshest conditions. 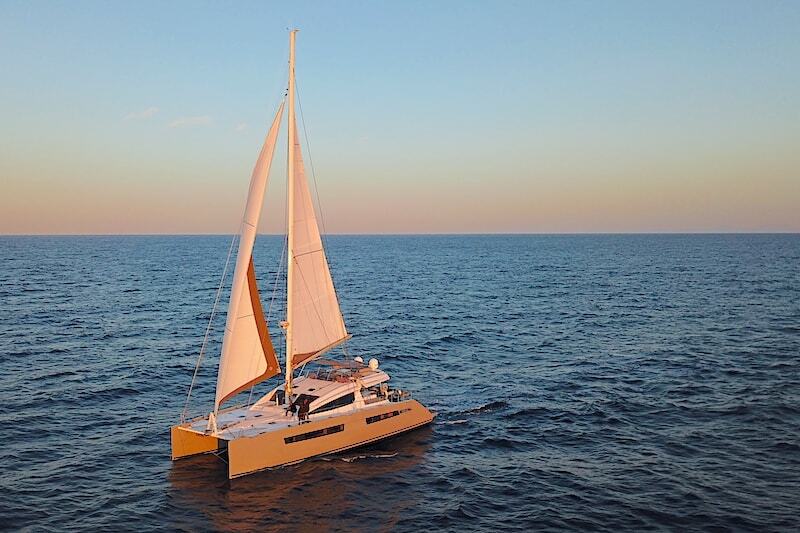 Moreover, let us not forget that we’re talking about a custom catamaran, where systems, fittings and space arrangement can be almost entirely customized around the owner’s needs, which is another evidence of the great attention to customers. 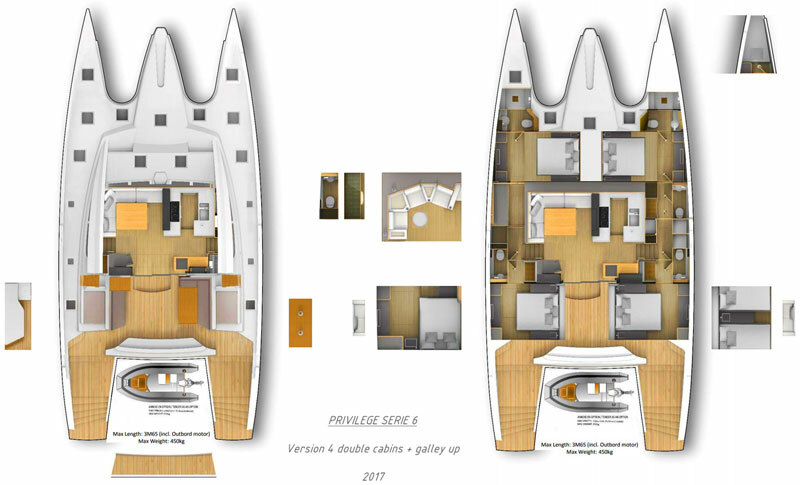 The Privilege 6 is currently offered for sale at EUR 2.5 million but, if we consider that anything you can imagine – onboard instrumentation, carbon mast, park avenue boon, electronic devices, and even a tender (with outboard)- is included, we can say that the price is right and rationally proportionate to the above-mentioned building quality. To whom it may concern: As soon as I gain control over my estate, I will be getting a serie 60, new of course, and sail the world slowly! 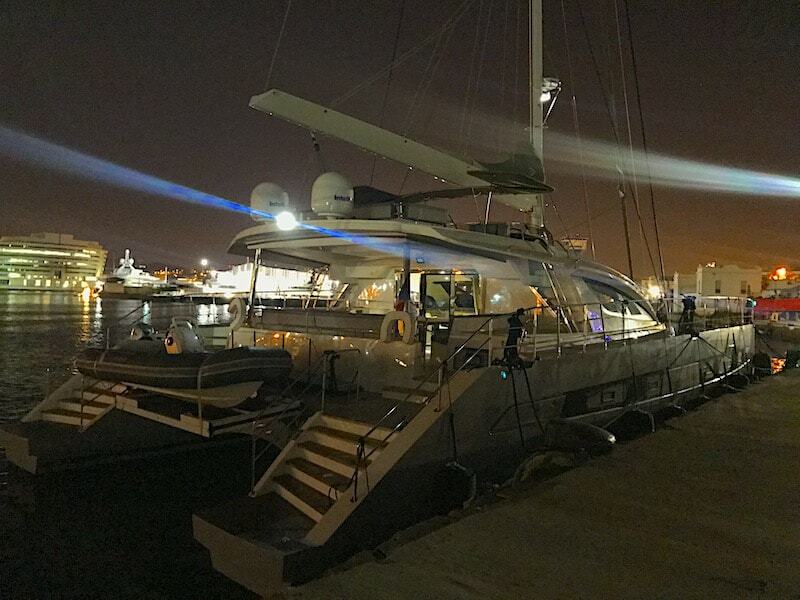 Thank You people for being committed to making such a fine catamaran! This includes everyone, including the man who sweeps the floors!! !